When we talk about cities boosting bike infrastructure, we’re typically talking about adding bike lanes and launching, or expanding, bike share. Building a multi-million dollar velodrome for high-speed, Olympic-style, indoor track racing isn’t typically part of that equation. But it now is in Philadelphia. Shortly after Mayor Nutter created the Philadelphia Bicycle Advocacy Board to help make the city a world-class cycling destination, he has thrown his support behind a private plan to build a $100 million velodrome inside FDR Park. The Philadelphia Inquirer reported that if the city hands over four acres of public parkland for the project, the arena’s organizers would provide between $5 million and $15 million in improvements for the rest of the 384-acre park. They would also create a four-acre replacement park. While the plan, titled Project 250, may sound like a subterranean, missile silo hidden somewhere in Nevada, it would actually bring a prominent architectural statement to Philadelphia. 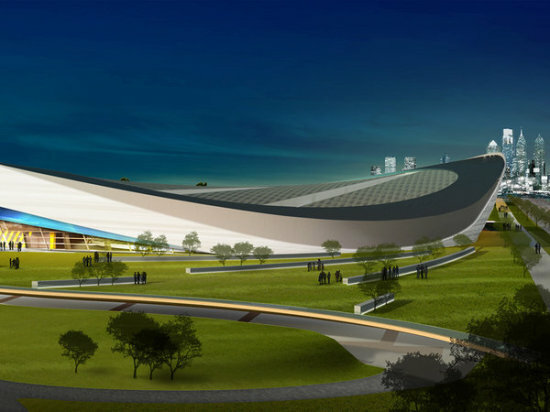 The Sheward Partnership has drawn up plans for the velodrome which would be a swooping, parabolic structure with a 55-foot-high roof. The building, with its lifted entrances, can perhaps best be described as Pringle-like or at least, Pringle-ish. Since velodrome cycling isn’t necessarily all that popular in the U.S., the 6,000-seat arena would be also programmed with concerts, and tennis and volleyball matches. Organizers told the Inquirer that it would be open to the public 80 percent of the time, and that amateur cyclists could buy hourly memberships. There would also be a classroom to teach free track-racing to low-income teens. Before any bikes can hit the track, however, Project 250 needs to be approved by the Parks & Recreation Commission, the Historical & Art Commission, and the City Council. It seems as if a day can’t go by without a new announcement from Brooklyn Bridge Park. 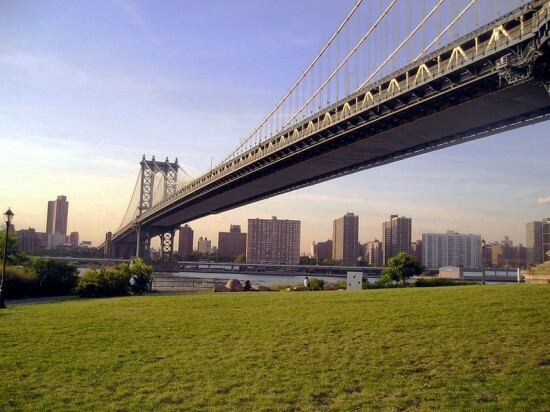 The Brooklyn Paper reported Tuesday that park planners are pushing for a free bouldering wall to be built beneath the Manhattan Bridge. 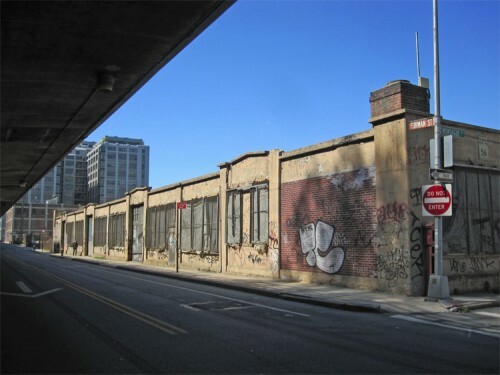 The proposal calls for a ten to 12-foot-tall climbing wall at Plymouth and Washington streets. This fits within a larger vision to develop the park area by Main Street by expanding lawn space, designing a new entry plaza, and relocating the dog run. This news comes right after philanthropist Joshua Rechnitz announced he was abandoning plans to build a velodrome, a complex for cyclists, in the park. As planners delved into the project, they found that the mounting costs of construction exceeded Rechnitz’s $50 million budget and growing concerns about flooding as a result of Hurricane Sandy added another layer of complexity to the design. Rechnitz, however, is still on the hunt for the right location for his velodrome in New York. An ambitious plan to build a $50 million velodrome in Brooklyn Bridge Park has been scrapped due to budget problems. 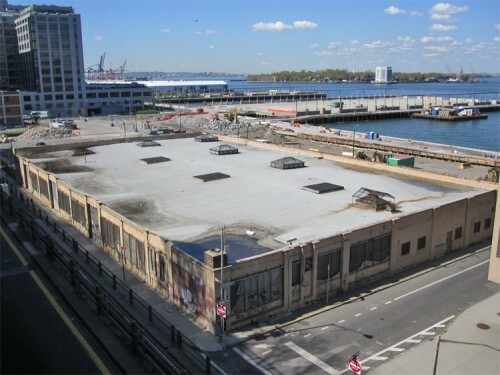 Philanthropist Joshua Rechnitz had committed funds for the project to be built inside the footprint of an old one-story industrial building sitting within the park boundaries but, despite scaling the project back, site requirements like an aesthetic roof and the risk of flooding at its waterfront site made the proposed building too expensive. Original plans called for a 650-foot-long inclined bike-racing track with nearly 2,500 fixed seats inside a 115,000-square-foot LEED certified structure, which could could be reconfigured to also accommodate basketball, tennis, volleyball, and gymnastics. The roof, visible from the Brooklyn Heights Promenade atop the BQE expressway, was to be a focal point of the building's design. Thomas Phifer and Partners had been tapped to design the velodrome but no design has been released. Greg Brooks, executive director of the nonprofit NYC Fieldhouse overseeing the project told the New York Times that the project will move forward at another site. “We’re very excited and eager to find a new home for this recreation center and velodrome. The funding remains intact,” he explained to the Times. Other previously-considered sites in New York and New Jersey will be looked at again. Brooks told the Times that the group reduced the size of the project to 95,000 square feet and only 500 seats, and elevated the building two feet to avoid flooding, but in the end the numbers wouldn't work. Some in the surrounding Brooklyn Heights neighborhood had opposed the project citing concerns over parking and the size of the new building. Park officials said they will return to their original plans to use the building as a maintenance warehouse. An avid cyclist plans to bring his passion for bike racing to Brooklyn Bridge Park. Joshua Rechnitz announced Thursday that his nonprofit, the New York City Fieldhouse, will build a $40 million multi-purpose recreation center on the inland edge of the park bordering the BQE. Now occupied by a deteriorating industrial building used for storage by the Brooklyn Bridge Park Corporation, the new facility designed by Thomas Phifer and Partners will include a modern velodrome along with space for a variety of other recreational activities. Architects have not begun designing the 115,000 square foot Fieldhouse, but the facility is expected to blend well with Michael Van Valkenburgh's surrounding landscape. The roof, which will be visible from the Brooklyn Heights Promenade above, is expected to become a signature design element and the structure will aim for LEED certification. Inside, the velodrome's 200-meter inclined track will dominate the space, but basketball, tennis, volleyball, and gymnastics will also be accommodated. Seating for nearly 2,500 people will be provided around the bike track. Maintenance areas and public restrooms for park visitors will also be provided. Besides competitive racing, the Fieldhouse will also offer the community cycling lessons, classes, and amateur races. Operations are expected to be self-funding. City officials and Brooklyn Bridge Park representatives praised the plans for bringing a year-round use to the park. “We want this to truly be a community endeavor that will add amenities for park users and provide a much needed all-weather sports facility,” Rechnitz said in a statement. A series of public meetings with the community will be scheduled to help guide the project forward and, pending review, construction could begin within a year and a half.